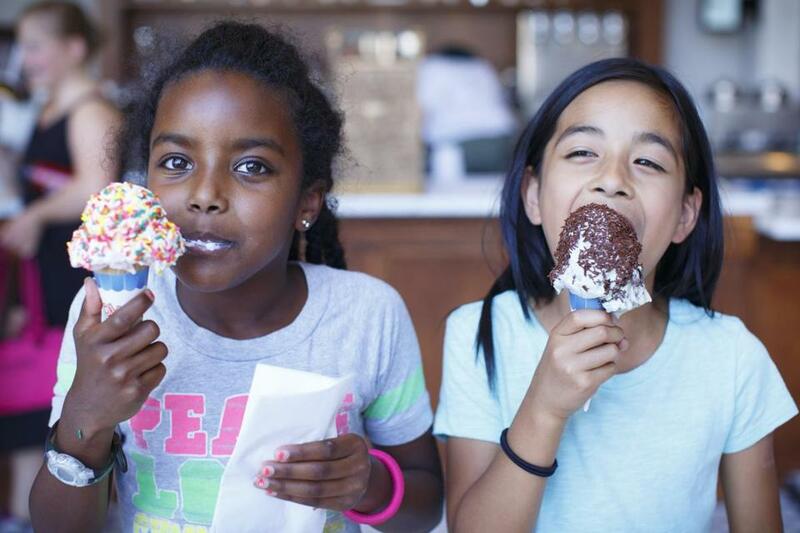 At Forge Ice Cream Bar, Lettie Carswell, 8, of Arlington enjoy a cone of strawberry with rainbow sprinkles and Clara Mapel, 8, of Cambridge a mint cookie and cream cone with chocolate sprinkles. First there was the cupcake trend. Then there was the doughnut explosion. Ice cream is the latest childhood dessert having a resurgence, with a host of new outfits — from pop-ups to small-batch producers to dairy-free alternatives — cropping up in recent years. Somerville remains a hotbed of frozen desserts today. 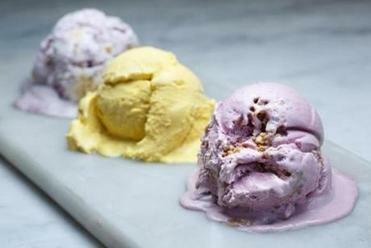 Gracie’s Ice Cream — known for its toasted Fluff cones and indulgent flavors inspired by the holiday-candy sales at nearby Market Basket — arrived in Union Square in late 2014. 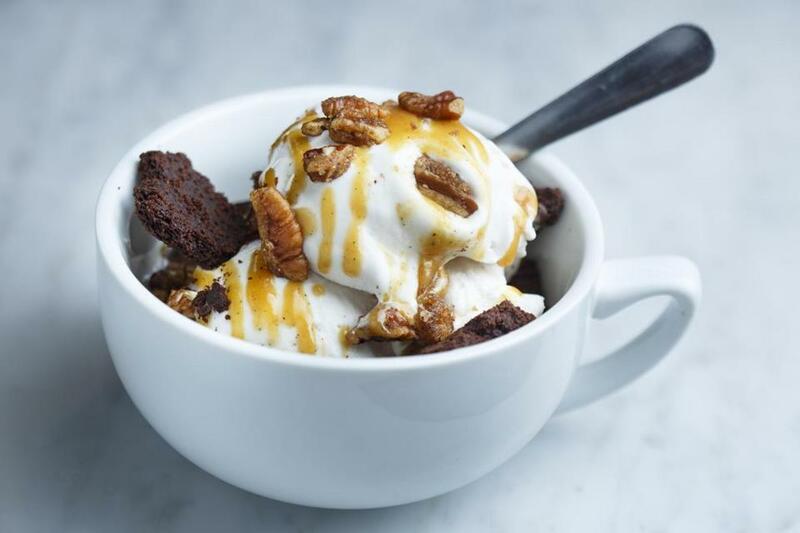 In May, nut-free scoop shop Tipping Cow opened in Winter Hill, the brick-and-mortar extension of a business started in a shared kitchen in Cambridge; founder Anna Gaul first sold flavors like strawberry-basil and Irish stout at farmers’ markets and area shops. In July, Forge Ice Cream Bar arrived, in a strip mall between Union and Porter squares. It may be brand new, but it looks as though it could have been here for ages. Owners Tucker Lewis and Jennifer Park scoured the Internet for original touches like the vintage fountain and a dipping cabinet. (The pair also runs Diesel Cafe, Bloc, and the adjacent Forge Baking Company.) Forge is born of noble ice cream lineage: Lewis and Park met working at Herrell’s — the follow-up to Steve’s that opened in 1980 — 20 years ago, and also spent time at Toscanini’s. Forge’s brownie sundae, with hot fudge and whipped cream. Where to go for torched Fluff cones, plant-based scoops, and long-lived innovation. But one no longer needs a storefront to get into the ice cream business. Just ask Jacqueline Dole, a former pastry chef who left Mei Mei Street Kitchen to spin new flavors at Gracie’s before branching out on her own in February with the Parlor Ice Cream Co.
Don’t let the name fool you: There is, in fact, no parlor. This is what Dole has dubbed “a roaming ice cream experience.” The pastry chef creates custom flavors — “curious combinations that push the boundaries of expected flavors,” as her website says — for wholesale, restaurants, and pop-ups. Think toasted coffee milk, miso and sesame caramel, maple parsnip, and farmers’ cheese with berry jam. Where does she make these many flavors? A shared kitchen, of course. The opening of such culinary incubators — places like CommonWealth Kitchen in Dorchester and Stock Pot Malden — makes it easier for entrepreneurs to start food businesses. They allow 17-year-old Grace Connor of Little G Ice Cream Co. to mix handmade cookies into her vanilla-bean base, and ex-corporate career woman Kelly Williamson of the Galley Ice Cream to whirl roasted strawberries and local honey into her small batches. Too, the on-demand economy offers more avenues for getting the product out there. 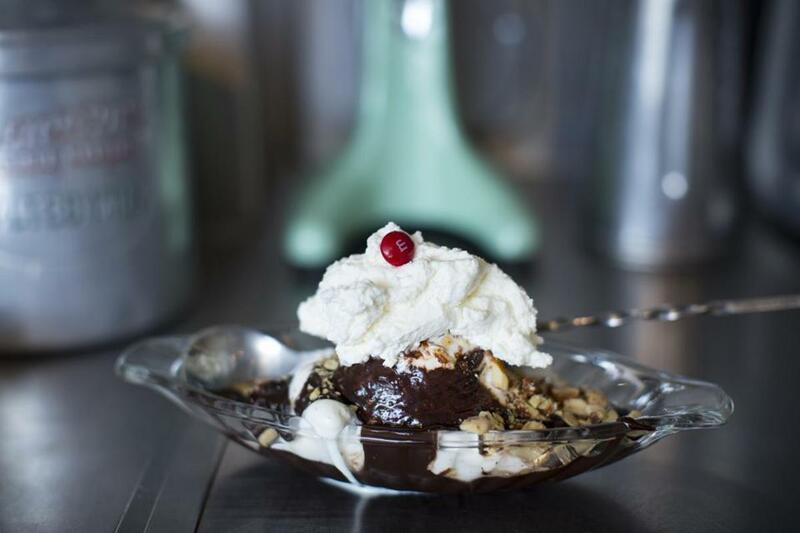 The Scoop ’N Scootery, for instance, is an Arlington-based ice cream delivery service: Just go to the website, order one of nearly 40 signature sundaes, and try to wait patiently until it arrives. (Customers can also pick up at the shop.) Honeycomb Creamery, which launched last year, both delivers pints and offers a monthly pint club. Operators Kristen Rummel and Rory Hanlon aim to open a shop in Cambridge any day now. FoMu’s vanilla bean ice cream sundae with caramel, chai candied pecans, and homemade oreos. Now FoMu’s flavors all start with a plant-based, from-scratch mix. “We literally start with a coconut — a coconut cream or a raw cashew cream that we can make ourselves and add organic sweeteners,” says Jalal. The business has grown; a South End shop opened in May, joining branches in Allston and Jamaica Plain, along with regular area pop-ups. Meanwhile, area stalwarts like Toscanini’s are still going strong. “We have a very informed group of customers who like to eat ice cream and are always looking for something different,” Rancatore says. Perhaps it’s because people in cold climates crave high-fat diets, he muses. Maybe it’s our dairy tradition, or the history of places like Howard Johnson’s and Friendly’s in the region. Whatever the reason, Rancatore says, Boston is a good place to be in the ice cream business.